This Pretty in Pink diaper cake has a very eye-pleasing design with its different shades of pink, flowers, and embellishments. Very pretty! Sandy, from North Carolina, made this delightful little number and submitted her photo and diaper cake 'recipe' for all of us to see. Our thanks, from every visitor of this website, goes out to Sandy for sharing her ideas, time and thoughtfulness! 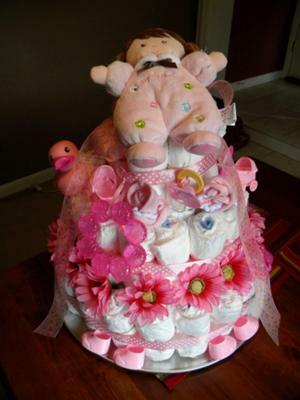 Thank you for your wonderful diaper cake, Sandy! I used all pink on this cake for one of my sister's baby shower..( baby Madison)...I used a plastic cake platter from a dollar store..around 80 size 2 diapers and various pink baby items tied with ribbon to the cake. Also used a baby's first doll for the topper.